Chris Achenbach-Kimmel stands for a portrait at Elizabethtown College where she works. This March marks the 40th anniversary of the partial meltdown at the Three Mile Island nuclear power plant. WITF is collaborating with PA Post and PennLive on a multimedia, monthlong look at the accident, its impact and the future of TMI and the nuclear industry. That includes new documentary television and radio programs, long-form audio stories, photos, and digital videos. The work will include the voices of people affected as well as community events to engage with listeners, readers and viewers. On March 28, 1979, Chris Achenbach-Kimmel was a 14-year-old freshman at Cedar Cliff High School in Camp Hill, Cumberland County. 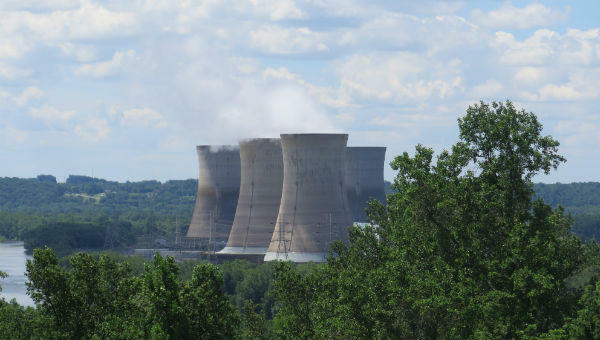 Fourteen miles away, on the Susquehanna River, staff at Three Mile Island Nuclear Generating Station were trying to contain the damage from an accident at one of its reactors. "I just remember being in class, and just getting the news, and wondering, what does this mean?" Her 17-year-old boyfriend tried to pick her up from school so they could flee from a threat they couldn't see and didn't understand. That didn't seem wise, and she stayed at home with her family in Lemoyne, while her father hunkered down in Steelton at the Saab auto dealership he owned. Her mother kept her and her siblings inside as much as possible. TV news reports echoed through the house as her mother waited for an "all clear" from authorities. When President Jimmy Carter visited the nuclear plant a few days after the accident, people started to relax, she said. Still, for weeks her father's auto service department was full of cars left behind by people who were in no hurry to return for them. One by one, the national news media left town, as the Nuclear Regulatory Commission assured the public that the matter was under control. For Achenbach-Kimmel, the accident became merely one more high school memory. She graduated in 1982 and went on to a career in occupational therapy. It wasn't until her thyroid cancer diagnosis in 2010 that she thought again about Three Mile Island. "I think as soon as I got over the initial shock, it's like, oh my gosh, I wonder if these two things are related," said Achenbach-Kimmel, now a 54-year-old academic fieldwork coordinator at the Elizabethtown College occupational therapy department. Her doctor wasn't surprised when Achenbach-Kimmel mentioned TMI. "She said, oh yeah, we see an increased incidence in the area compared to what my colleagues see around the country." Pennsylvania has had one of the highest thyroid cancer rates in recent years, according to Centers for Disease Control. For those who grew up in the midstate, Chris's story is a common one. People blame TMI for their illnesses, and some doctors accept it could have been the case. Yet, the nuclear industry's position has been that there has been no conclusive link between the accident and adverse health effects. "That's not to say that there weren't any radioactive releases during the accident, but they were at such a low level that they would not be expected to have any sort of ill health effects," said Nuclear Regulatory Commission spokesman Neil Sheehan. He noted a 2000 University of Pittsburgh Medical Center study that found the accident didn't cause an increase in cancer mortality among people living within a five-mile radius of the plant. However, a 2017 Penn State College of Medicine Study suggests that may not have been the case. 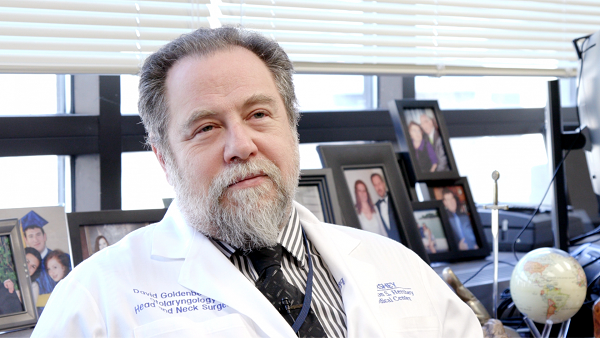 Dr. David Goldenberg, a surgeon and thyroid researcher, launched the study after years of hearing his patients bring up the nuclear plant accident. Although Pennsylvania has the nation's highest rate of thyroid cancer, most of that cancer has nothing to do with Three Mile Island, Goldenberg said. However, thyroid cancer caused by low-level radiation has a different "mutational signal" than most thyroid cancer, Goldenberg said. He and his colleagues used molecular research that had been pioneered after the Chernobyl nuclear disaster to find that genetic marker. The scientists screened out many thyroid cancer patients, limiting their study to 44 people who were born in counties around Three Mile Island, were present during the accident and were treated at Penn State Hershey Medical Center. "We found a shift, which absolutely can be attributed to exposure to radiation, during the correct time frame of the Three Mile Island accident," he said, adding that this does not prove that TMI caused the cancer. It just shows a correlation. Goldenberg is quick to point out the study's limitations, emphasizing that he's working on a larger follow-up study. Still, it has put him in the middle of a 40-year-old debate: Did the accident at TMI release more radiation than the government says? Did it harm people? For Christine Layman, there's no question--and the Penn State study has given her hope. Layman was 21 years old when the accident happened, living within five miles of the plant in Conewago Township, York County. "They made me leave," she said. "The fire department were riding around in fire trucks and actually told me, please evacuate the area." She's faced thyroid disease and cervical cancer, leading to a hysterectomy when she was 34. Her daughter, who was 4 at the time of the accident, also has had cervical cancer, Layman said. She attributes the illnesses to radiation exposure. Dr. David Goldenberg talks about his 2016 study, which showed that people who were near TMI during the accident and developed thyroid cancer share a common genetic marker. The Penn State College of Medicine study says nothing about cervical cancer. However, Layman said the study shows the scientific community that there's more work to be done. "Just from what I'm hearing, this study is going to help validate these peoples' stories, because they just feel like nobody believes them." Layman manages a Facebook group of people who attribute their illnesses to the accident, which has more than 3,600 members. She said stories abound of people with cancer, thyroid disorders and other health problems. Almost two years since the Penn State College of Medicine study, the reaction from nuclear regulators has been "disappointing," said Cindy Folkers, a scientist at Beyond Nuclear, which opposes nuclear energy. Pointing to a recent National Academy of Science conference she attended, Folkers said radiation experts have learned from Three Mile Island: Going forward, there are plans in place to build "health registries" when a public health disaster occurs. However, when it comes to TMI, the nuclear industry has ignored what she called "biometric" evidence from a 1997 study by University of North Carolina Chapel Hill scientist Steven Wing. That study showed a connection between the accident and lung cancer and leukemia in a "plume" that traveled from the plant. However, the nuclear energy industry dismissed it because they disagreed with its approach, Folkers said. This conversation often leads back to a familiar place: Radiation monitors around Three Mile Island after the accident occurred. It's true that those monitors did read "off the charts," said Sheehan at Nuclear Regulatory Commission. However, that doesn't mean high amounts of radiation were released. The monitors were set "at a conservative level," Sheehan said, and when scientists were able to recalculate the releases, they found that people would have been exposed to no more than 100 millirems of radiation--about a sixth of what the average person in the U.S. is exposed to each year. In Elizabethtown, Achenbach-Kimmel said she recognizes how hard it can be to prove what happened. She doesn't expect anything from the nuclear industry or the government. Noting that the government has failed to come up with a long-term plan to store its nuclear waste, Achenbach-Kimmel is more worried that humanity didn't learn any lessons from the accident. When she was attending a thyroid cancer survivors' support group, everyone believed the partial meltdown may have had a role. However, she doesn't share the certainty that some people had. "I'm going to say that probably the best way to characterize my opinion is the jury's still out," she said. Pittsburgh City Council amended its controversial gun-control legislation Wednesday, making some provisions dependent on state approval, while adding new language councilors said the city can enforce on its own. Penn State will collect hundreds of thousands of dollars left over from the defunct charity for youth founded by convicted child molester Jerry Sandusky, settling claims from a threatened civil lawsuit. If you want to get a conviction scrubbed in Pennsylvania, you had better have at least $63 set aside. Eight bucks to download the application. $20 for a criminal background check, another $10 for a driving record, and then a $25 processing fee. Getting access to family planning and reproductive health care is already difficult for low-income Pennsylvanians in rural counties, but it could become more difficult under a pending rule from the Trump administration. The rule, which will go into effect May 3, makes sweeping changes to the federal Title X program.